My only criticism of the museum is that neither the signage (well, any that I saw) nor the museum map made clear the significance of getting into that space at the bottom level. We might have missed it but for museum staffers who more than once announced clearly to various clusters of visitors that they must not skip the historical exhibition. 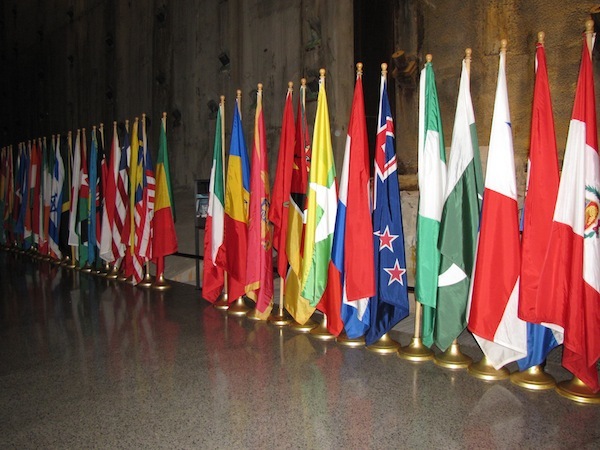 Displayed inside the 9/11 Museum, a lineup of flags from the dozens of countries whose citizens were victims on 9/11. It is set up in three sections, devoted to events leading up to the attack, including the 1993 bombing at the trade center (which killed six); to the events of the day itself, and to the aftermath. Warning signs advise when an exhibit or experience may be disturbing, and these are in spaces visitors don’t have to enter. Tapes of cell phone calls from victims telling their families they loved them were one example. Those were indeed disturbing. 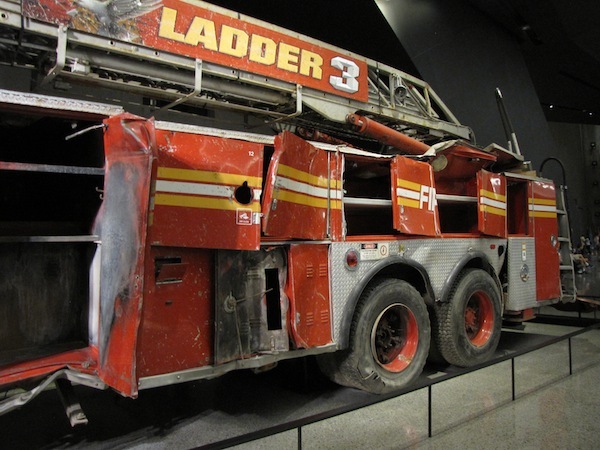 New York City fire truck, destroyed on 9/11 and now seen in the 9/11 Museum, just outside the entry point for the museum’s main historical exhibition. Events associated with the 9/11 attacks were thoroughly covered in the media, so much will be familiar to visitors. However, the museum knits the material (and perhaps our fragmented memories) into a helpful whole. Outside this main historical section, some displays are devoted to the destroyed buildings themselves, particularly the Twin Towers. One panel was packed with mind-boggling trivia. • There were 43,600 windows in the Twin Towers, and it took two months to wash them all. • On windy days, the towers swayed 12 inches from side to side. 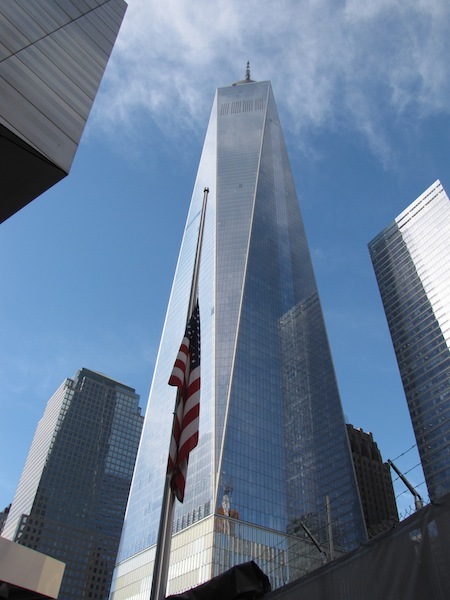 • And, the South Tower Observation Deck’s outdoor viewing platform, at 1,377 feet, was the highest in the world. On a clear day, one could see 45 miles in every direction. The original World Trade Center, although a workplace for 50,000, was a major tourist attraction, too. Now, I believe it will attract even more. It was not surprising either to hear a wide variety of languages and accents among those who visited with us. Aside from the museum, the new 1,776-foot One World Trade Center (popularly called Freedom Tower) seems built to be photographed. And the center’s plaza includes, besides the memorial reflecting pools, hundreds of oak trees, benches and walkways. It’s a place for living in the present, as well as remembering. 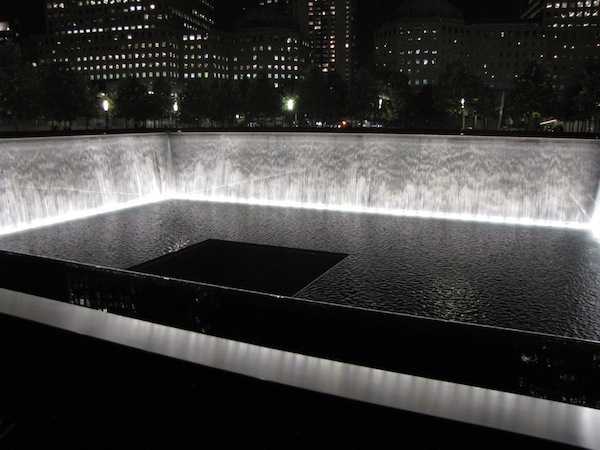 One of the memorial reflecting pools, on the site of the South Tower, at the World Trade Center, seen at night. Timed entry tickets, which were required when I visited last year, are no longer required for the World Trade Center site. The grounds are open to anyone, like any other plaza and business area in New York City. One World Trade Center, with a U.S. flag in the foreground, seen from the area where museumgoers wait for free tickets to the 9/11 Museum. But, museum tickets are timed, and one can buy those in advance on the Web. For most adults, the entry is a rather stiff $24. There are various concessions that reduce this rate, plus free entry for families of 9/11 victims, 9/11 rescue and recovery workers, active/retired members of the military and museum members. However, to ensure all can have access to the historical artifacts regardless of means — or at least, I presume that is the reason — anyone can enter at no charge late on Tuesdays. Some of the free tickets can be reserved on the Web, too, but the rest are handed out Tuesday afternoons on a first-come, first-served basis. That worked brilliantly for my sister and me. On-site distribution of free tickets begins at 4:30 p.m., and, we were told, we could line up beginning at 4, but the line formed sooner. We joined it around 3:40 with perhaps 50 to 75 people ahead of us. We also were told the tickets are handed out at the rate of 600 every 30 minutes. I assume that process lasts only 60 to 90 minutes because the last entry Tuesdays is 6 p.m. On any day, the museum’s last entry time is two hours before closing. Given we were among the first 600, our tickets were timed for a 5 p.m. entry, and we were in the building promptly, maybe a bit before 5.